ViSR™ (Virtual Interactive Study Room) combines advanced WEB2.0 technologies with the latest research and technologies in education, to provide unique one-on-one Chinese teaching systems and applications, an integrated learning environment and omni-directional supervision rules. We strive to provide the most innovative and intuitive study environment. You will discover that learning Chinese can be fun and easy. What is so unique about ViSR™? 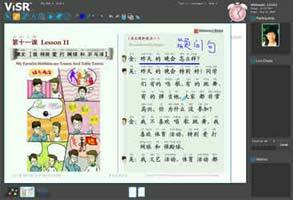 With our stimulating interactive Chinese study environment and well designed course materials, not only can you communicate easily with your teacher by typing live-text messages, you can also hand-write or doodle on the writing tablet. You can also share documents or learning materials with other students or teachers. An innovative system which combines traditional one-on-one tutorial teaching methods with the latest advances in computerized education techniques. Qualified teachers are available 24/7, at times that suit your learning needs, and with our unique online teaching solutions, it’s easy to create the perfect Chinese language learning environment, as if you were in your own private classroom, with one-on-one teaching at its best! 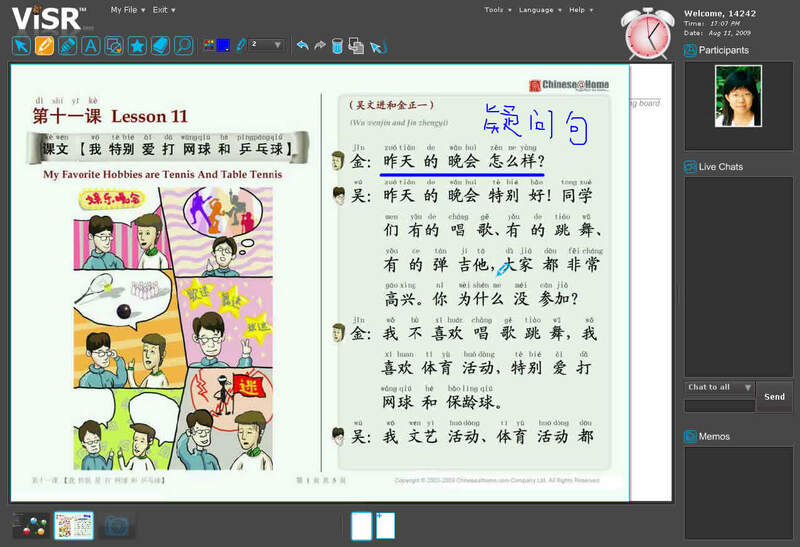 Another innovative and important aspect of ViSR™ is that it allows you to record and save the whole session of your Chinese class, so you can go back and review your queries, questions and answers whenever you need. Within our playback feature, you can review, repeat and share all your lessons, over and over again, to ensure you get the full benefit of your studies. It also allows you to browse a library of lessons that other students have taken, available for you to replay and purchase – and it’s growing all the time! Upload your homework to your teacher just the same as “handing in” real homework in the traditional way, for your teacher to mark and comment on your work. A service allowing you to ask questions to online instructors in real time. Your Chinese skills can be improved dramatically by interacting with a real person. 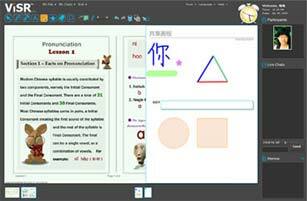 ViSR™ is a whole new experience, and a great Chinese learning journey for all!